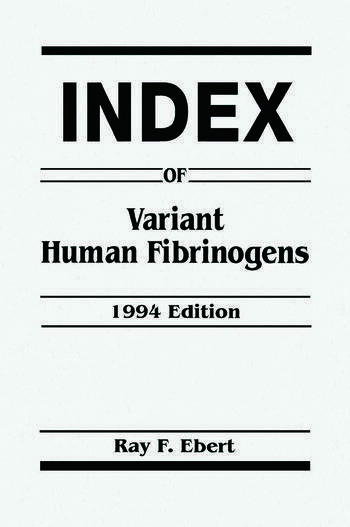 Whether you're a clinician concerned with patient management, a technician involved in diagnostic testing, or an investigator studying fibrinogen structure and function, you'll find that the 1994 Index of Variant Human Fibrinogens. is a valuable resource. It contains not only the most comprehensive compilation of the world literature and research on dyfibrinogenemia, but also includes a synopsis for health professionals and expert guidance for the diagnosis and treatment of dysfibrinogenemia, the study of genetically abnormal human fibrinogens. Furthermore, this book provides the latest DNA and protein sequences (including the AaE chain) and listings of available PCR primers and anti-fibrinogen antibodies. Add to this a set of 263 Dysfibrinogen Reports tracking more than 30 different characteristics for each variant, plus 9 summary tables and a comprehensive bibliography, and the result is an authoritative companion for the diagnosis and management of this multifaceted and complex disease. Compare your patient's laboratory profile, clinical manifestations, or molecular defect with virtually all others in the literature. Consider all the options for treating bleeding or thrombotic complications. Determine if your data from a newly identified variant are unique. Spend an hour with this book and see if it doesn't save many hours of literature searching and summarizing!